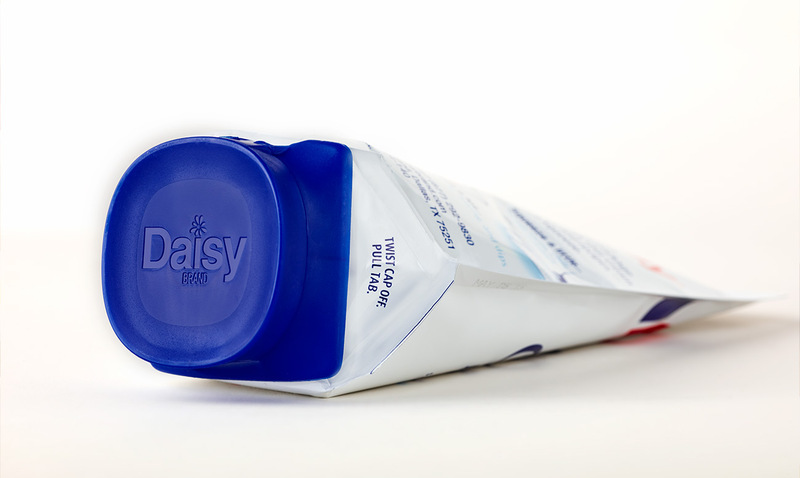 Daisy partnered with Continuum to innovate new packaging for a classic product. Sour cream is a staple in kitchens across America for more reason than one. Not only a common recipe ingredient for cooking and baking, sour cream is also used as a topping on feel-good family dishes like chili and tacos. But, as any taco aficionado can attest, dolloping sour cream into a narrow shell is awkward at best. And as the tub makes its way around the table, bits of cheese or beans from the serving spoon can sneak their way into the container, leaving behind unwanted leftovers in the once-pure sour cream. Despite its varied uses, Daisy Sour Cream has historically come in only one package—the familiar white plastic tub. 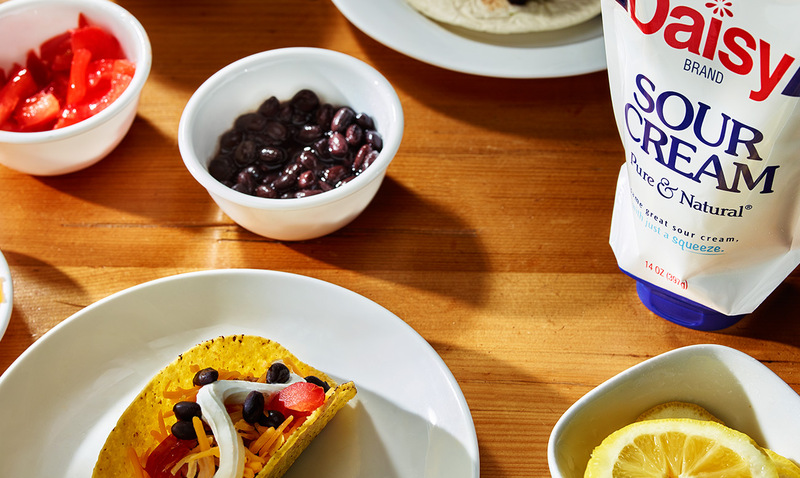 Knowing that more than half of all sour cream is consumed as a topping, and recognizing the consumer pain points associated with the traditional tub, Daisy Brand set out to change the way we dollop. The leading dairy manufacturer partnered with Continuum to design a squeezable container that met consumers’ needs and expectations and did not compromise the quality and consistency for which the brand is known. The team began by visiting families in their homes, and sitting down with them at taco dinners to observe real customer interactions and gauge their expectations. More than a free meal, this research method proved highly effective in getting authentic feedback about what mattered most to Daisy’s consumers. After testing hundreds of squeezable prototypes with consumers, our team worked collaboratively with the client and key manufacturers to bring the first inverted foil pouch in the dairy food category to market in 2015. 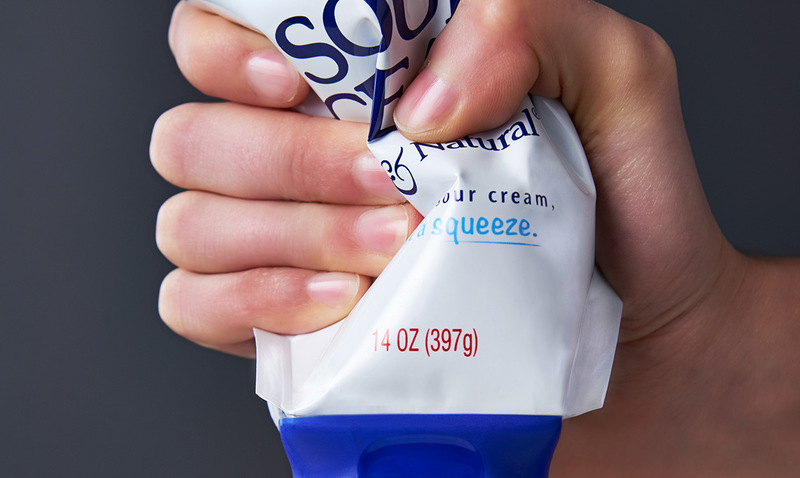 Daisy’s Squeeze pouch provides a massive leap in functionality and convenience, while keeping retail price competitive with existing tub products. But what’s the best thing about the Daisy Squeeze? The sour cream inside is exactly the same. Flexible and fun to use, the Daisy Squeeze balances the legacy of a great product with a commitment to modern consumer needs. The combination of features holds Food Containment and Delivery System Patent US 8844767 B1. Getting the material (foil) right required over 40 R&D trials. The ring-pull fitment is a customized tearaway seal that ensures product freshness and provides tamper evidence to consumers. Daisy Squeeze Sour Cream began making its way into dairy aisles across the U.S. in the spring of 2015, and is now available at at most major grocery retailers including Stop & Shop, Wegmans, and Walmart. 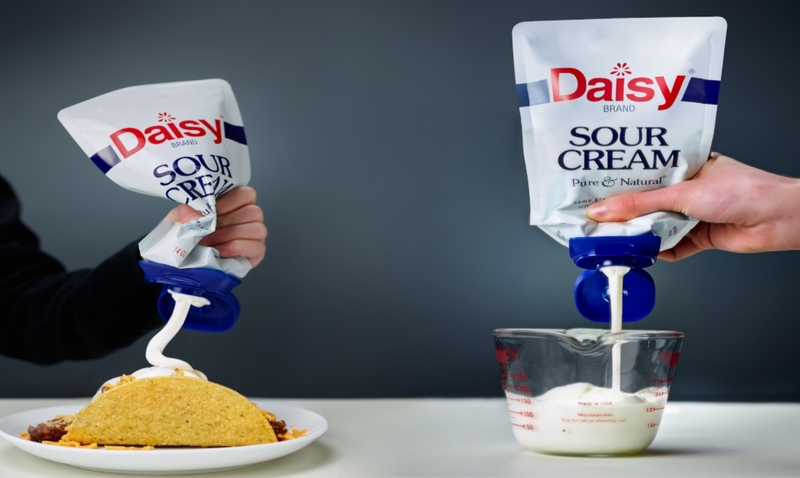 In the short time it has been on the market, Daisy Squeeze ranks among the top 10 sour cream items in sales. In a recent customer survey, 60% of Daisy Squeeze users said they would recommend the product to a friend—20% more than the average. 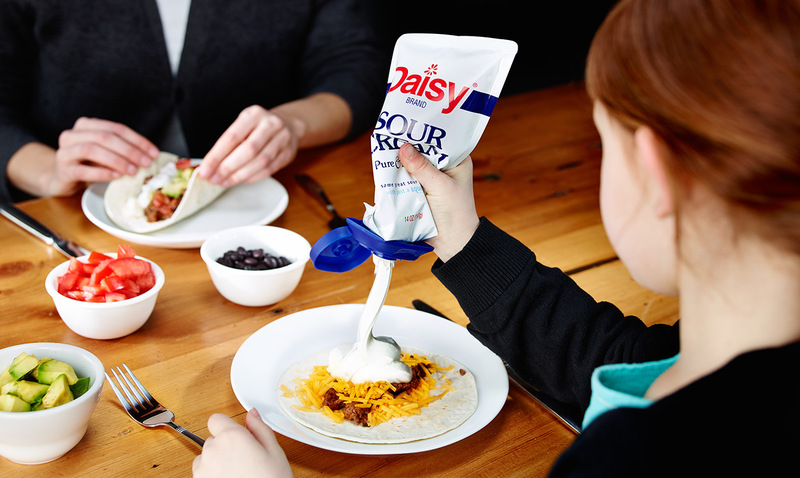 As for the devoted Daisy consumers so eager for sour cream they can squeeze, a scan of Daisy Brand's Facebook page indicates that fans are thrilled with the company’s response to their collective request for a squeezable sour cream. With Unilever, we created the first handheld, FDA-approved laser for in-home use.